The first time I saw the trailer for this movie, I came away thinking this has potential. Had I just seen the movie poster art, I would automatically assume it was just another cheap, by-the-numbers attempt at making a good clown horror flick. That would, as it turns out, be very wrong. Story here is the main focus which is refreshing to see in a horror movie these days. A Dad with good intentions tries saving his son’s birthday when the clown who was booked couldn’t make it, so he finds a clown costume in one of the homes he is trying to sell for his real-estate gig. He turns out being a hero showing up to his kid’s birthday, late, but wearing a clown costume, and surprisingly doing a good job at it. He falls asleep wearing the clown getup and slowly begins to realize, the makeup, and costume, do not want to come off no matter what extreme methods he takes. For example, he uses a saw to try and cut off the clown suit, and things backfire miserably. 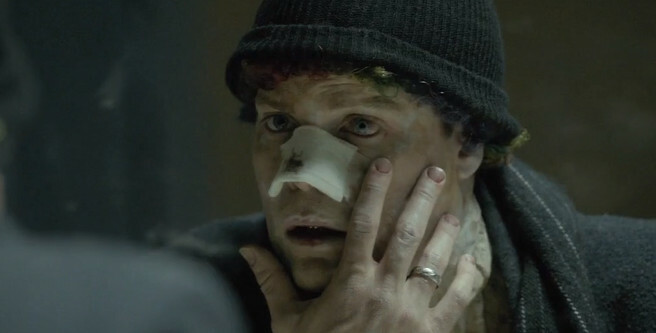 Slowly exploring this character’s plight into madness was done effectively, and intelligently. After several failed attempts, our main character discovers what he is wearing is an evil clown suit. I really enjoyed the evil demon clown origins they explain in this movie. It all is executed far better than how it sounds here. Clown is a fairly unique take on a genre that often misses the mark. The performances are solid, production values fair, and not overstated. Again, the story is the focus here, nothing too flashy occurs to distract you, because there is no need to, it’s engaging enough on its own. Recommending this film is easy for me. 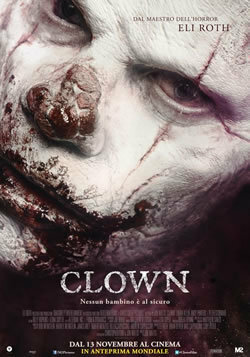 Hopefully people give it a shot and don’t assume it’s yet just another low budget, crappy clown movie. If you have a region-free blu-ray player, it’s worth checking out, as it’s already available in the UK. This entry was posted in Movie Reviews and tagged clown, cloyne, demon clown, demons, eli roth, evil clown. Bookmark the permalink. Glad this one is finally out, in some fashion.